Manufacturers in the mobile construction cranes market are investing in the research and development activities to develop robot cranes and introduce new technology. Adoption of new technology is enabling mobile construction cranes to be energy efficient, and compact. However, mobile construction cranes market worldwide is facing challenges due to the skilled labor shortage and increased cost of labor. The market is anticipated to witness a slow growth. The latest report by Fact.MR expects the mobile construction cranes market to surpass $9,000 million revenue by the end of 2018. Growth in the renewable energy projects to meet the ever-increasing demand for power supply also is one of the factors driving demand in the mobile construction cranes market. The demand for all terrain crane is projected to expand at a significant rate during the forecast period 2018-2028. Ability to operate in all types of weather conditions and terrain, superior off-road mobility, capacity to lift high loads, and ability to move quickly on public roads are some of the benefits driving demand for all terrain cranes in the mobile construction cranes market. Growth in the number of cement plants and shipbuilding/repair is accelerating the demand for all terrain crane in the mobile construction cranes market. Significant growth in construction and retrofit market in emerging economies also are resulting in the rising demand for all terrain cranes and other mobile construction cranes. Meanwhile, Europe is witnessing increasing up-gradation and repair of both existing infrastructure and power grids. Hence, the demand for all terrain crane in the mobile construction cranes market is likely to increase in the region. "Sales of all terrain cranes across various industries is estimated to increase in the coming years. Crawler cranes, a type of mobile construction crane, are also likely to witness a huge demand in the construction sector. Meanwhile, market valuation for all terrain crane is estimated to reach more than $3,000 million revenue by 2018 end, accounting for maximum revenue share in terms of product in the mobile construction cranes market," said Mohit Loshali, senior research consultant at Fact.MR. However, high initial investment along with high maintenance cost of all terrain cranes may hamper the growth of the product in the mobile construction cranes market across various regions. The demand for mobile construction cranes is anticipated to grow at a significant phase throughout the forecast period, 2018-2028. Rise in infrastructure development with the need for high lifting capacity application for construction involving great height is driving the growth for mobile construction cranes in the construction industry. Asia-Pacific accounts for the largest share in the construction industry, with growth opportunities for mobile construction cranes manufacturers in India, China and Japan. Hence, momentum in the infrastructure sector in the region is likely to result in the sluggish performance of the mobile construction cranes market. Moreover, a rise in the road, railway and metro projects are providing good demand for mobile construction cranes. Heavy investment in new construction projects is expected in Southeast Asia, notably in Malaysia, Philippines and Indonesia. Expansion in the construction industry in the region is expected to fuel the demand furthermore. 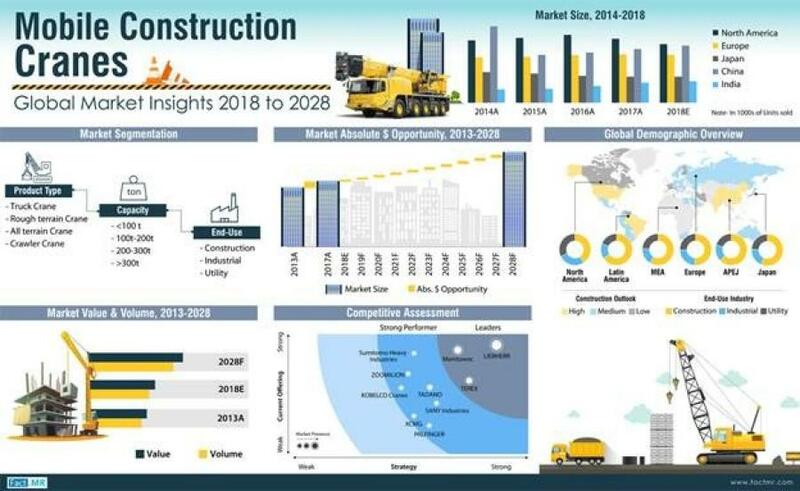 The construction sector is likely to witness the substantial growth during 2018-2028 in the mobile construction cranes market. Moreover, the construction sector is expected to account for the highest revenue share bringing in more than $5,000 million by the end of 2018 in the mobile construction cranes market. Meanwhile, the government in the Middle East is investing profoundly in the development of transportation, ports and building infrastructure. As a result, the enormous demand for heavy lifting equipment such as mobile construction cranes and special transport services is expected in the region. Mobile construction cranes with less than 100 tons capacity are likely to witness highest sales throughout 2018-2028. Low price, less fuel consumption, and convenient in assembling and carrying loads are some of the benefits of mobile construction cranes with less than 100 tons capacity. The overall outlook of the mobile construction cranes market is likely to remain optimistic, with global demand for mobile construction cranes expanding at 3.5 percent CAGR in terms of value during the forecast period 2018-2028.